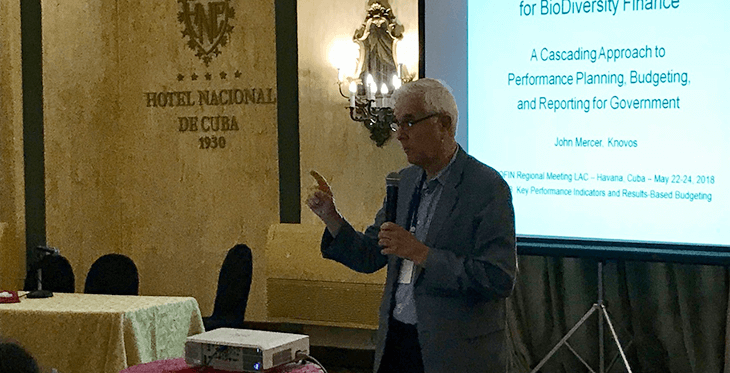 Knovos Director for Government Performance John Mercer recently demonstrated our Cascade software to a dozen Latin American and Caribbean countries at a meeting of the United Nations Development Programme (UNDP) in Havana, Cuba. At the request of UNDP, John made a presentation on Cascade’s innovative approach to governmental performance planning, budgeting, and reporting. The 4th Regional Biodiversity Finance Imitative (BIOFIN) Workshop on Environmental Accounting for Policy Analysis was held on May 22–24. The overarching objective of BIOFIN is to deliver a new methodological framework that facilitates the identification, development and implementation of optimal and evidence-based finance plans and solutions. BIOFIN is coordinated by UNDP.